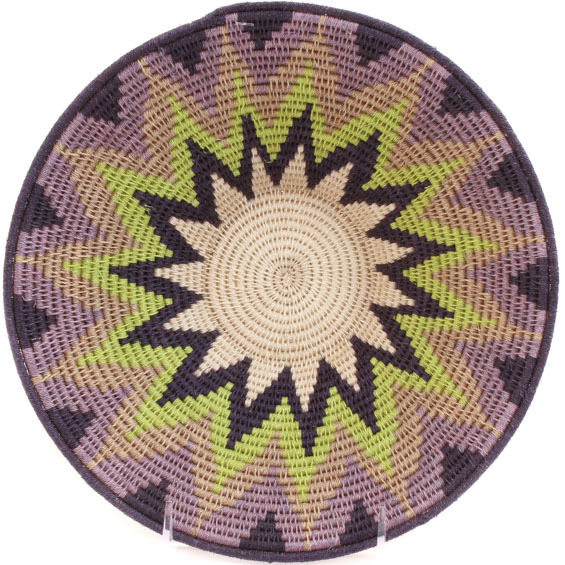 Traditionally given as a gift to symbolize a long and happy life, this highly collectible basket was handmade in Swaziland from Sisal fibers gathered from the sisal plant. The sisal plant is in the Agave family and its fibers are so known for strength that it is increasingly being used as an environmentally-friendly strengthening agent to replace harmful substances in industrial production processes. Each fiber is harvested, dried, hand dyed, dried again, then rolled against the weaver's leg until the perfect thread is drawn out. An average of 30-40 hours per basket makes these one of the most labor intensive of all African baskets for their size. As a bowl gets larger, it takes more and more time to weave because the coils on each row become much longer as the bowl flares upwards and outwards. So adding one row at the top of the basket could be equivalent to weaving 5-7 rows or more in the base of the basket. This is the reason the larger baskets are more unusual, take so much more time to create, and are only done by masterweavers.